Skoda Karoq Boot Space, Size, Seats | What Car? It’s unlikely that anyone will get into the Karoq and start grumbling about a lack of room in the front. It’s possible to slide the driver’s seat back by a good amount to accommodate long legs, while those long of body will find the seat drops low enough to give plenty of head room. The only caveat, and it’s a slight one, is that the optional panoramic sunroof nabs a bit of head room. There are acres of storage spaces on board, including big door bins and cubbies around the central dashboard area. Being Skoda, it has gone the extra mile with handy touches, including a storage box with an umbrella under the passenger’s seat. 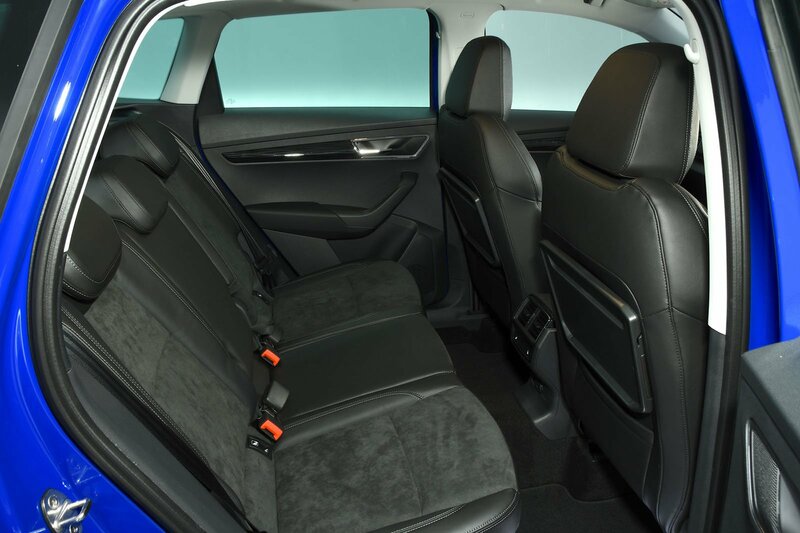 Because the Karoq is a family-focused SUV, its rear door openings are particularly large – this should make fitting a car seat a fairly painless affair. And for adults back there, there’s plenty of leg room, so even six-footers won’t find their knees pressed up against the front seatbacks. Head room should be fine, too; the Karoq’s roof is higher than the Nissan Qashqai’s, but a Seat Ateca or Volkswagen Tiguan offer a tad more space in this respect. The only time this becomes relevant is when the panoramic roof is fitted – it’s not as limiting as it is in a Peugeot 3008, but it’s still worth checking that you’re happy by sitting in the back of a car equipped with one before ordering. So it’s fine for two people. But what about a third? Well, there’s a high central floor tunnel to clamber over and, once in place, the middle passenger is a little squished. We wouldn’t recommend a long trip for three at the back, unless they are smaller kids, in which case they’ll be fine. 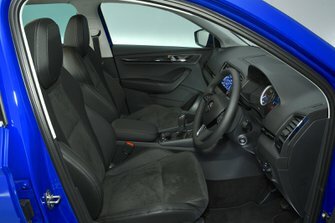 If you have the VarioFlex rear seats fitted – standard from SE L grade – you get three individual rear seats that each slide and recline. This is an area where the Karoq wipes the floor with its rivals – even closely related ones such as the Ateca. The VarioFlex seats fitted as standard to the SE L and Edition trims, and optional on SE, do all sorts of clever things. For a start, they’re split evenly rather than 60/40 – this offers much more flexibility when carrying long loads combined with rear passengers. But that’s not all; they individually slide and recline. And if you want to turn your family SUV into a mini van, here’s the trump card: you can remove all three rear seats completely, freeing up even more space. Without VarioFlex seats, the rear seats are split 60/40 and don’t slide or recline. 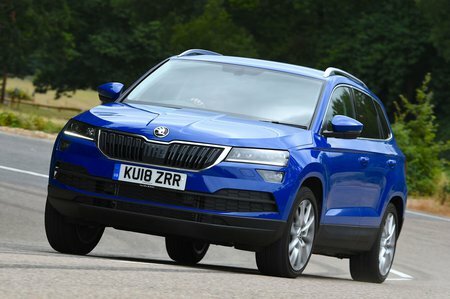 Although the Karoq’s boot isn’t the biggest in the class, it provides a sizeable space relative to its similarly priced equivalents. Even the Ateca, which is very similar to the Karoq, can’t manage quite as much, as we found when we tried loading in carry-on suitcases – the Ateca managed eight, while the Karoq swallowed nine. And that’s all under the tonneau cover and without sliding the rear seats forward (something you can do with the VarioFlex seats fitted) to increase boot space further. Without the VarioFlex seats, the Karoq can still offer an adjustable boot floor, which creates a separate space underneath for delicate items. It’s a useful feature that also gives you a flat and level boot floor when you fold down the rear seats. However, we’d still recommend the VarioFlex seats (standard on SE L and Edition trims) for their superb flexibility. Their benefits include the option of removing them entirely to create a huge boot right up to the front seats. The only downside is that they’re heavy and cumbersome, so you need to plan; that is, remove them before you find yourself in the Currys car park with a fridge-freezer and the choice of what’s going to be left behind. You also get a range of hooks, trays and other clever features that should stop your shopping from sloshing around the boot when you’re driving home.